Hair loss is a common condition faced by more than 35 million men, two thirds of which will have noticeable balding by age 35. While balding is commonplace and has few physical harms, it can be emotionally traumatic to those who experience it. Because hair loss is linked to genetics, aging, or health conditions like thyroid disease or high stress, many feel helpless. Topical solutions and pills can lessen hair loss, but are fuelled by false promises you’ll go back to a permanent, healthy head of hair. Failing to find a solution for hair loss can cause depression and low self-esteem. Balding directly impacts how you are viewed professionally, within your social circle, and how you see yourself. Culturally, a full head of healthy hair is associated with youth and desirability and is seen as an indicator of status and health. At Verso Surgery Centre, we have a permanent solution to solve your hair loss and restore your confidence: the ARTAS Robotic Hair Transplant System. Dr. Jack Kolenda is one of few physicians in the Greater Toronto Area who offers the state-of-the-art treatment that yields more hair than traditional transplants, leaving you with natural hair that lasts a lifetime. 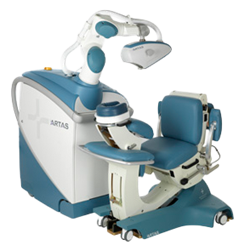 A robotic hair transplant is more precise and accurate in extracting plantable hair, resulting in a fuller head of hair. The procedure is less invasive than traditional hair transplants too. There are no stitches and scarring involved, and patients don’t experience scalp tightness typically associated with older transplant techniques. Recovery time is fast – one to three days – and postoperative pain is limited. Dr. Kolenda offers the procedure in a modern facility located in Oakville. With a hospital-grade surgical operating suite, his clinic offers patients a superior level of care shorter wait times and greater privacy to ensure a better experience. Having practised for more than a decade, Dr. Kolenda, an Otolaryngologist, Head and Neck surgeon, has built a solid reputation in the GTA and beyond. As well as a first-rate bedside manner, his patients receive caring and conscientious follow-up treatment.